Between 4th July and 15th July road users in Wincanton, Bruton, and Castle Cary will yet again be subject to a major road closure to allow resurfacing of a section of the A371 road between Bratton Seymour and Cary Hill. The full closure will be Monday to Friday, but the road will be open to traffic over weekends. The works are concentrated on a short section of the A371 (heading towards Castle Cary) just after the junction for Gibbet Road (left) and Bratton Seymour (right), continuing until just before the junction for Shatwell Lane (left). 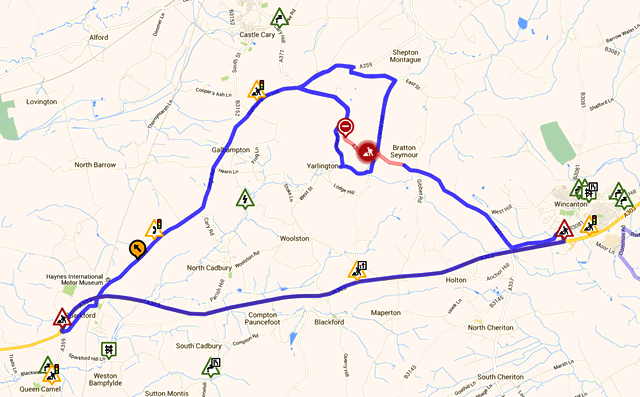 Traffic to and from Wincanton and Castle Cary will be diverted via Sparkford and the A303. This is the latest in a long line of roadworks projects. Between 2013 and 2014 overhaul of the railway bridge at Castle Cary resulted in a major diversion, causing collateral damage to the local Castle Cary economy. Negative effects were even felt further afield in Wincanton. Anchor Hill Service Station suffered a slump of around 30% in their normal fuel sales owing to the normal through traffic from Castle Cary being cut off and diverted further west via Sparkford. The A371 is a main north/south route for deliveries to many local businesses and for through traffic to many south coast destinations. It’s also a popular tourist route. It looks likely that we will see further disruption to the local business economy, but this time mainly in the Wincanton area, with traffic once again being routed south via Sparkford before travelling east to Wincanton. Anchor Hill may yet again fall victim to this latest set of roadworks when all through traffic passes them by.